Nineteenth-Century Disability: Cultures & Contexts | Blind! This black and white photograph shows Elizabeth Gilbert wearing a cape and shaded glasses. From the Frontispiece of the book Elizabeth Gilbert and her Work for the Blind, Frances Martin, 1887 [available at http://archive.org/details/cu31924031232493] Elizabeth Gilbert, the founder of the Association for Promoting the General Welfare of the Blind, lost her sight in early childhood as a result of scarlet fever. 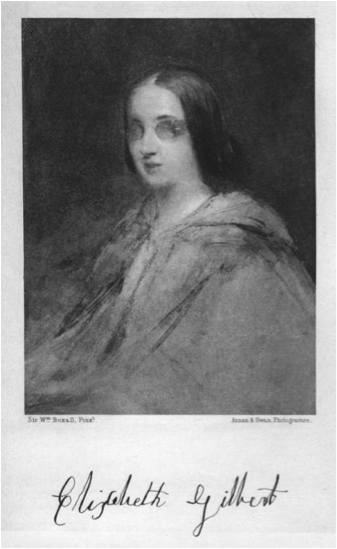 When Dinah Mulock Craik, the author of John Halifax, Gentleman and The Little Lame Prince, wrote her essay, ‘Blind’, about the Association for Promoting the General Welfare of the Blind, in 1861, she was engaging in an active discussion about the education of the visually impaired in the mid-nineteenth-century. Charles Dickens had written an essay in 1859 entitled ‘At Work in the Dark’ and Craik’s friend and flatmate, Francis Martin, published another in 1864 for Cornhill Magazine entitled ‘Blind Workers and Blind Helpers’. Each essay promotes the valuable work of the association, in providing education and retraining for the visually impaired, and explains how readers can help and support the association, and by extension the people who work there, through the purchase of brushes, baskets and mats etc made by the pupils and workers at the association. In the following extract, which opens Craik’s essay, we are told of a chance encounter between a sighted person (Craik) and a young visually impaired man. Craik portrays the man as being at ease and confident in his movement and remarks on his firm step and active appearance, walking as if he ‘saw every step of the road’. Whilst Craik presents a more personal encounter with the man than Dickens does in his essay, nineteenth-century attitudes to blindness are evident. Craik expresses surprise at the man’s ability to walk through the city independently, a common view as it was widely believed that the blind were incapable of living productive lives and were often treated as children in need of protection. Craik’s insistence that she accompany the man to the door, despite his protestations, reveals how the sighted struggled to understand how the blind could manage without their help. The extract also highlights the way in which the blind were seen as a curiosity or spectacle by the sighted as Craik lies in wait, virtually spying on the man, in order to observe how he found his way without assistance. In addition to this we can see how blindness was considered to be a tragedy or ‘misfortune’ as the face of the young man continued to ‘haunt’ Craik long after their meeting has ended. I turned, and now first noticed a young man who had just passed me by, stepping out quickly and decisively, with a stick in his hand and a bundle on his shoulder. “Ma’am, if you please, would you direct me to …?” naming a gentleman’s house close by, which I was proceeding to point out to him, when I perceived he had no eyes. It was a well-featured and highly intelligent countenance, with that peculiarly peaceful expression that one often sees on the faces of the blind; but of his calamity there could be no doubt: the eyes, as I said, were gone: the eyelids closed tightly over nothing. Yet his step was firm, and his general appearance so active and bright, that a careless passenger would scarcely have detected that he was blind. Of course I went back with him to the door he named – in spite of his polite protestations that there was not the least necessity – “he could find it easily” – how, Heaven knows: also, I had the curiosity to lies in wait a few minutes, until I watched him come cheerily out, shoulder his big bundle, plant his stick on the ground and walk briskly back – whistling a lively tune, and marching as fast and fearlessly as though he saw every step of the road. Sealing the eyelids over the sockets suggests this man may have lost his eyesight as a result of an ophthalmic infection which caused the eyeballs to rupture. See Mary Wilson Carpenter, Health, Medicine and Society in Victorian England (Santa Barbara, California: Praeger, 2010): 128-148 for further information on blindness. The Association for Promoting the General Welfare of the Blind continues today under the name ‘Clarity’. A video clip, made by Clarity, to celebrate the 200-year anniversary of Charles Dickens is available at www.claritymatters.org/blog/charles-dickens-and-clarity/. Here Clarity staff members discuss Dickens’ essay and the degree to which things have changed or remained the same since the nineteenth century. Carpenter, Mary Wilson. Health, Medicine and Society in Victorian England. Santa Barbara, California: Praeger, 2010. Stoddard Holmes, Martha. Fictions of Affliction: Physical Disability in Victorian Culture. Ann Arbor: University of Michigan Press, 2009 . Dinah Craik , “Blind!,” Nineteenth-Century Disability: Cultures & Contexts, accessed April 23, 2019, http://nineteenthcenturydisability.org/items/show/32.